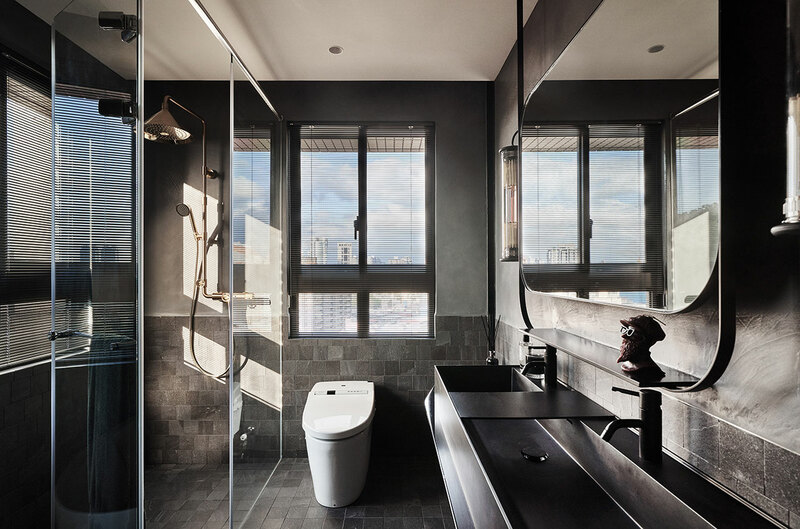 When Taiwanese interior design practice KC Design Studio was commissioned by a young couple with a toddler to renovate this 125 square metres apartment in the north of Taiwan where they were settling down after living abroad for many years, their goal was to create a contemporary environment of comfort and convenience that also reflected the couple’s distinct aesthetic sensibilities. 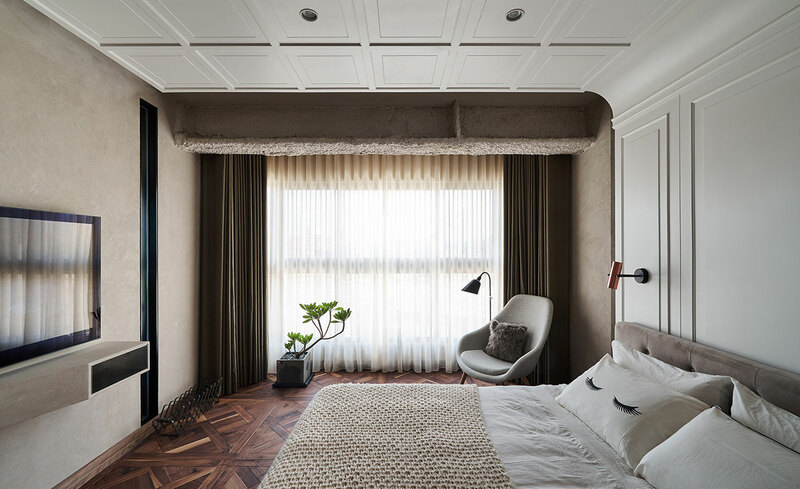 The result is an elegantly idiosyncratic apartment that harmoniously combines the husband’s preference for modernist design and the wife’s fondness of natural materials, a dream house so to speak to raise their growing family. 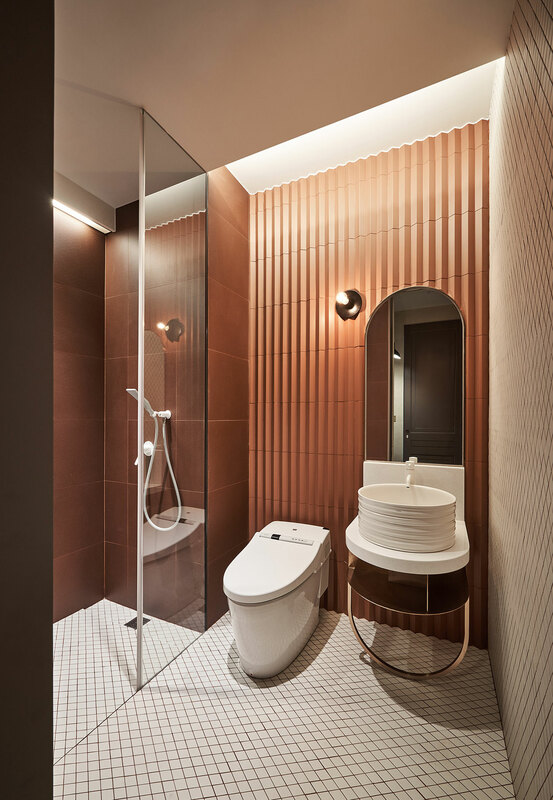 The new layout divides the apartment longitudinally into two parallel zones, a public section centred on an open-plan living and dining area that opens up to a balcony, and the family’s private quarters which comprise a master bedroom and bathroom, a dressing room and a bedroom for the couple’s child. 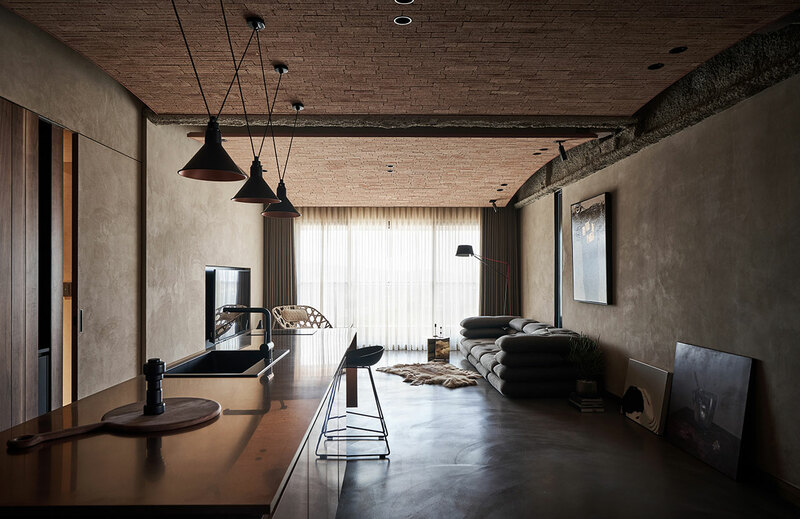 Bisecting the apartment in two, the dividing wall that separates the two zones purposefully runs below a structural steel beam thereby integrating it into the design. 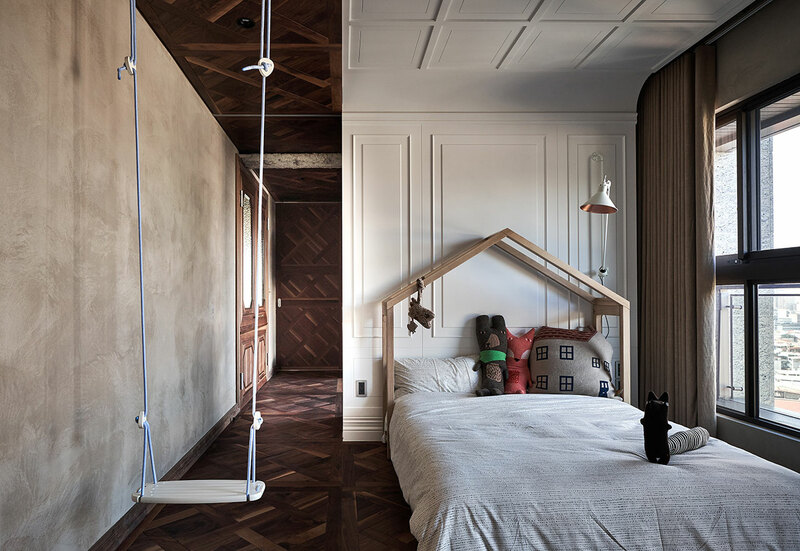 Other low-hanging beams and pipes that inconveniently transverse the ceiling throughout the apartment had to be more creatively dealt with. 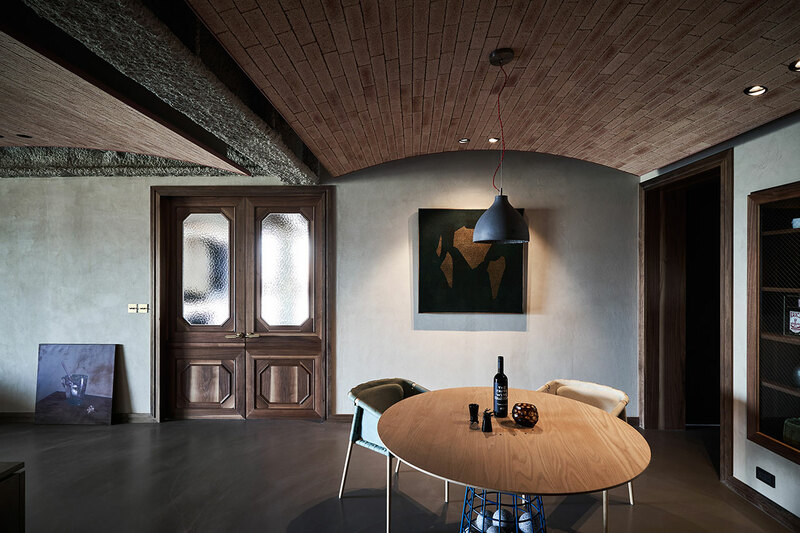 In the main living space, the designers have introduced concave ceiling panels that smoothly arch between the steel beams creating a cellar-like ambience. 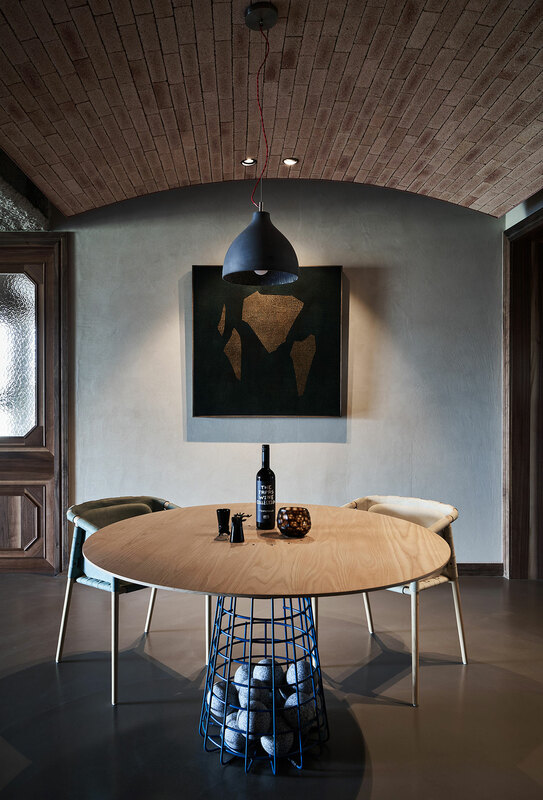 Crucially, the arched sections do not touch the beams allowing for the narrow spaces in between to be used for running ventilation ducts. 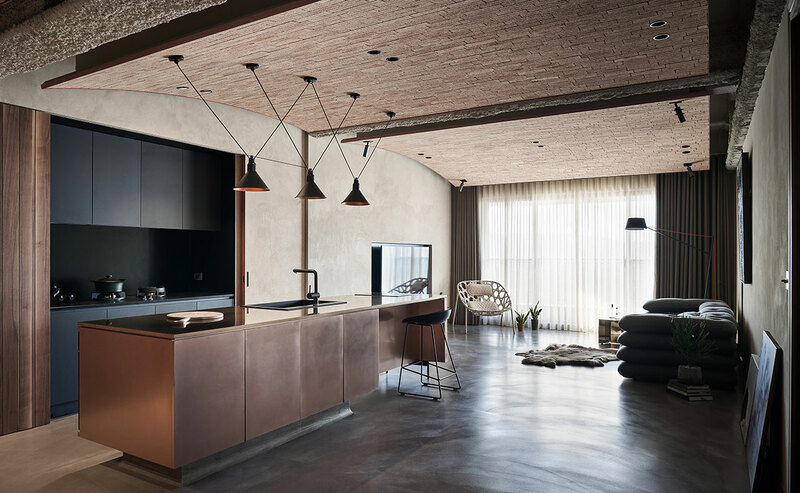 Treated with a layer of sprayed concrete, the textured girders perfectly complement the brickwork of the ceiling sections which along with the polished concrete floor and the beige colour-washed walls evince a refined industrial vibe. 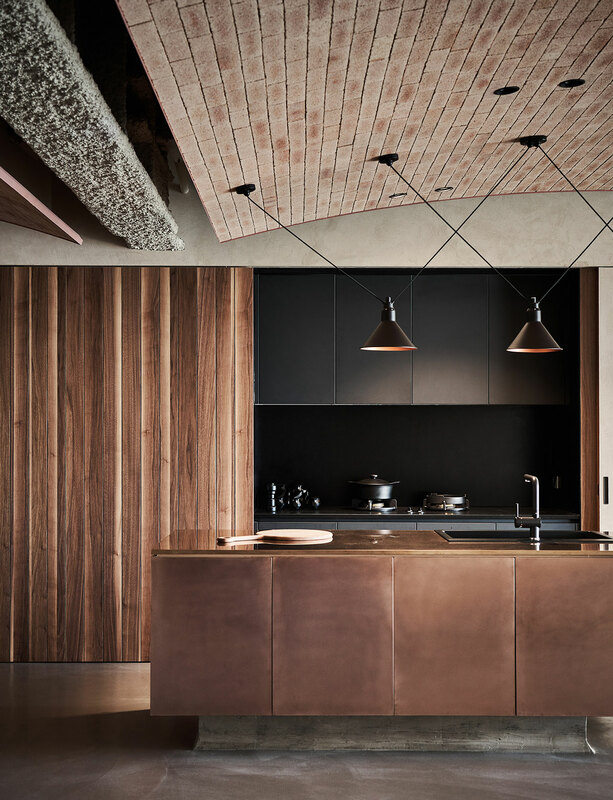 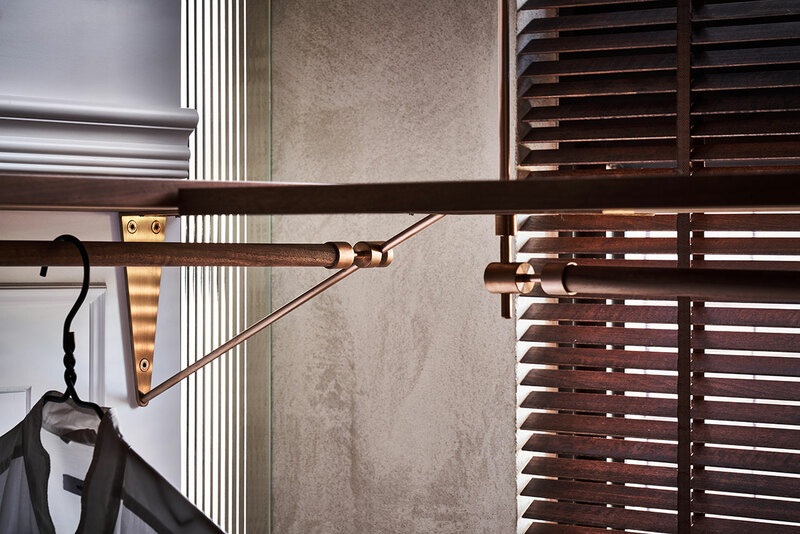 The use of natural material is further enhanced by the bronze panels that clad the kitchen island and the timber strips that are used for wall panelling. 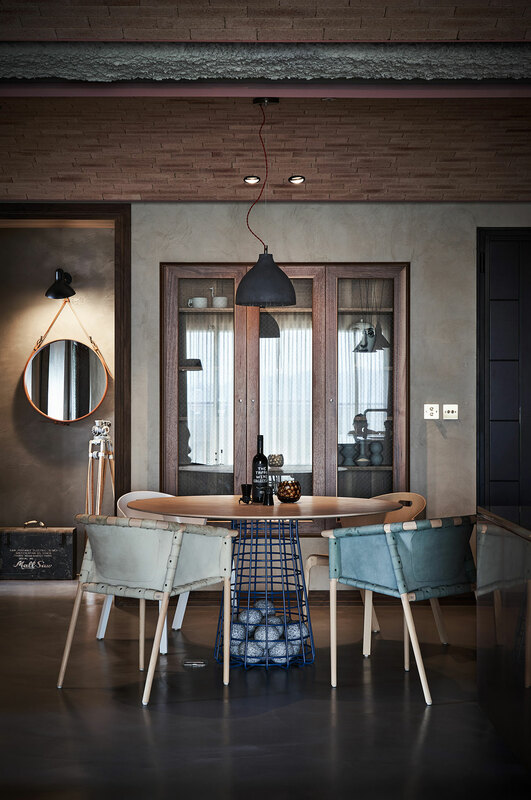 This diverse palette of natural materials is harmoniously weaved together by a modernist aesthetic of clean-cut lines and minimalist trimmings and complemented by a sparse selection of sleek light fittings in a black finish and modern furniture pieces that reflect both the husband’s less-is-more sensibility and the wife’s fondness for natural materials. 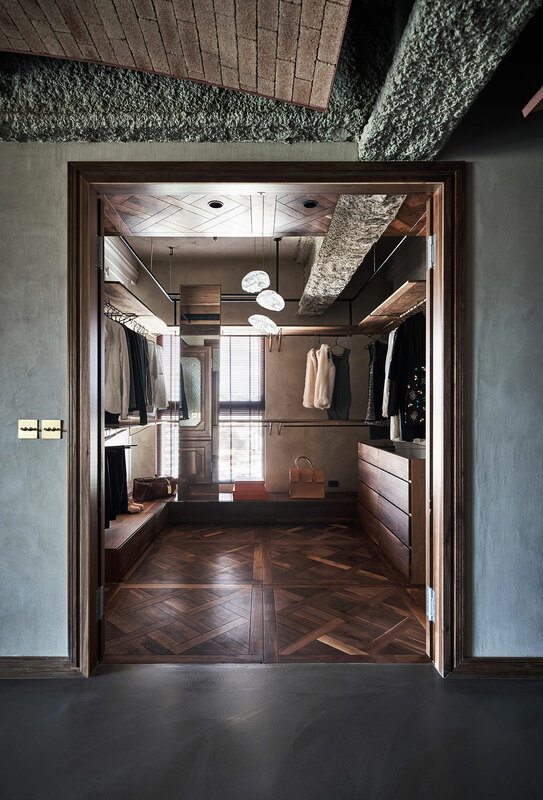 A more stylized aesthetic is used for the private quarters that feature classic white wood panelling on the walls and a decorative hardwood parquet on the floor, both of which are ingeniously also used on the ceilings, the former in the two bedrooms and dressing room, and the latter to delineate a corridor of sorts that connects these three rooms. 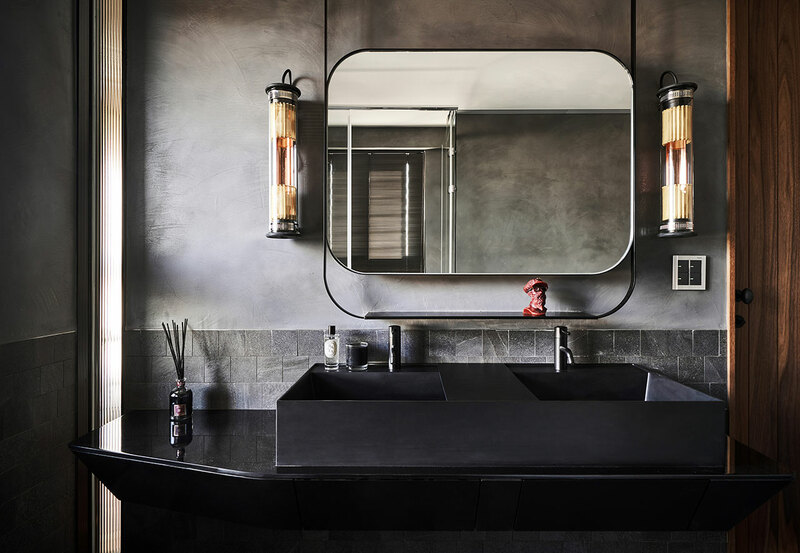 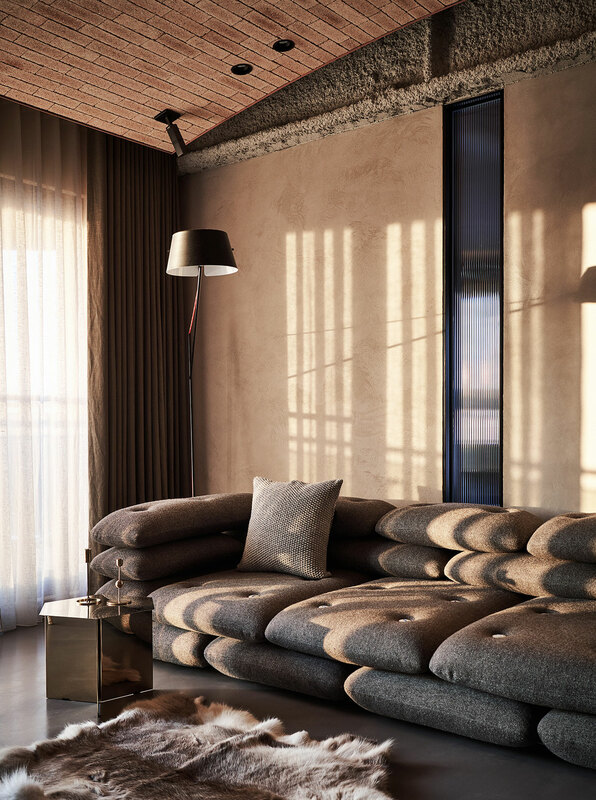 Despite the subtle decorative flourishes that these spaces embrace, there is a clear aesthetic continuity running throughout the apartment based on a shared, eclectic palette of colours, materials and textures such as brown wood, bronze plating, sprayed concrete and beige colour-wash. 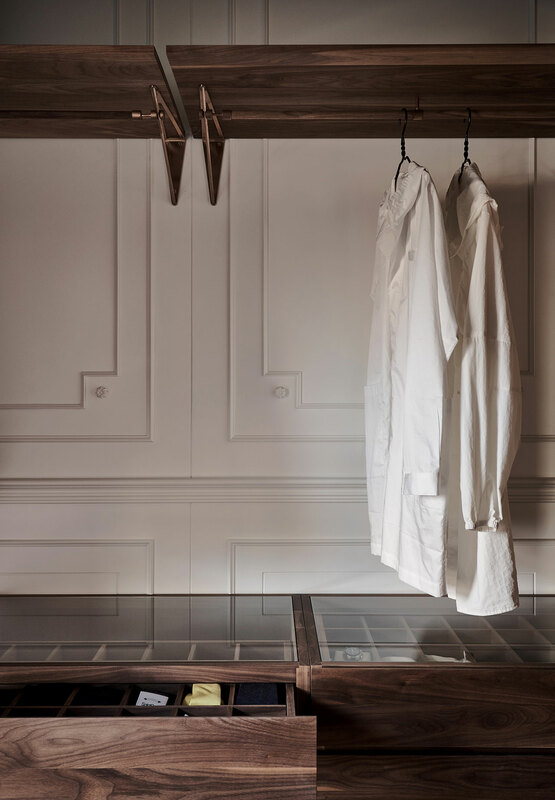 But more than that, the apartment comes together through KC Studio’s design language of unrefined elegance and crisp craftsmanship.